As a Back to the Future fan since childhood, I've always loved the idea they'd make a video game of it. Telltale Games got the rights, and both Michael J. Fox and Christopher Lloyd allowed the use of their likenesses- and this game was the result. Granted, I'm a couple years behind in obtaining it. Luckily for me, I got all 5 episodes of this series on one PS3 disc- so I could play it straight through. I'm not much of a point-and-click gamer, but this wasn't bad. The Telltale Games' stylized characters are easily recognizable and the look grew on me quite swiftly. Of course Doc Brown, voiced by Lloyd himself, got to stretch his character a bit with a variant version that is a totalitarian of laws instead of being his nice, albeit slightly crazy, inventor self. So he gets a 1984-esque Hill Valley that has little crime, but everyone is sort of oppressed. 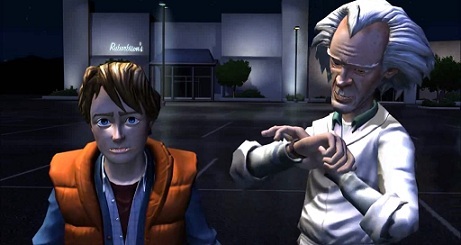 Marty McFly is now voiced by a fellow that does a remarkably outstanding job, A.J. Locascio, because Mr. Fox was unable to do do it. Although Fox does play a couple other McFlys that appear towards the end of the series. Plenty of secondary characters make appearances as well including both Marty's parents, mention of Principle Strickland, and plenty of Biff's in each era visited. Anyway, the game relies on simple puzzles and conversation options to get things done. It isn't anything too frustrating, keeping in mind you are playing as Marty and not Doc- so they keep the inventiveness to a minimum. Even Einstein (Doc's dog) is used in multiple puzzles or ways of getting to the next objective. There are plenty of interesting nods to the films and this game seems to fit in fairly well. They aren't forced, all the nods flow with the narrative perfectly. Other than the slow nature of the point-and-clicks (having to walk back and forth through areas at a snails pace is a bit annoying), the game was done very well, and I would recommend it to anyone wanting to revisit the Back to the Future series with a new experience. It's pretty much an interactive cartoon based on the films, a game truly made for the fans.